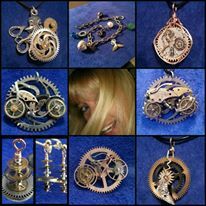 Maker Faire Orlando Oct. 22nd & 23rd – Chaordicwear – Up-cycled, One-of-a-kind, Handmade Jewelry you can Wear everyday! Making Order out of Chaos! I am so honored to be selected as a maker of the Maker Faire Orlando 2016, it is going to be soooooo much fun. Please stop by and let me know you saw this post, mention it and receive 30% off a one of a kind piece. I will also be letting children choose their color of cord or ribbon with a wood gear free of charge, just for stopping by 🙂 while supplies last.